At the Arizona Grand Resort, all the comforts of home combine with a host of amenities to give travelers the perfect get away. More than 700 newly renovated suites combine luxury with an intimate, residential-style comfort that will appeal to travelers of all ages and interests. The resort also offers a grand spa experience that promises to relax and refresh, while the several onsite restaurants give guests the food options they are looking for in a top-notch golf resort. 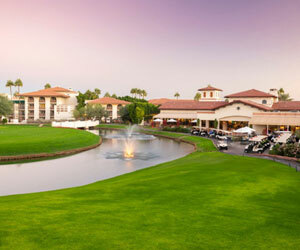 Outdoor activities abound at the Arizona Grand Resort. For those who enjoy frolicking in the water, the Grand Resort's Oasis Water Park offers thrills and fun with an eight-story high tower with three thrilling water slides along with a mammoth wave machine that will delight frolickers of all ages. For golfers, the Arizona Grand Golf Course offers up a blend of traditional links and desert golf challenges. Arizona's South Mountain Park will be a golfer's guide through the round, while the staff will do what it takes to assure golfers of all levels have the Arizona resort golf experience of their dreams. Offering the best of all worlds, the Arizona Grand Resort continues to stand tall in the desert.